SeaShorts Film Festival will show case contemporary films made by film students in Malaysia while looking for new up-and coming young filmmakers to work with in the future! Zara must serve a community service sentence after being convicted to theft only to learn the true meaning of friendship and love. Director: Izzat Sahar is an independent young filmmaker born and raised in Kuala Lumpur. He loves to dream, and he dreams big. He takes every opportunity in the film industry to learn exactly the procedures and flows from pre to post. ‘Kakek’ is his first short film, made together with Hominid Pictures as his Final Year Project at Multimedia University’s Faculty of Cinematic Arts. Majd is a 23 years old young man who has been in detention for 5 years and been released a few months ago. A documentary filmmaker decided to make a film about Majd, and we will know more about his life with every question will be asked. Director: Dia Zaiem, an indie Syrian filmmaker born on 26/06/1992 in Damascus, Syria. Bachelor holder of Arts in Digital Film & Television from Limkokwing University in Malaysia. He participated in more than 12 films in different positions: Director, Writer, Actor, Editor and Gaffer. This is a story about a woman accept and give up a new life in her body in 7 days, it is describe a women's anxious and strong. Potong is a short film about a boy named Kenneth who develops a crush for his Malay classmate, Sarah. However, Kenneth’s best friend David, a cheeky popular boy in school decides to tell him about the requirement of circumcision in order to court Malay girls. Leaving Kenneth in a dilemma on how he could win the heart of this charming girl in his class. 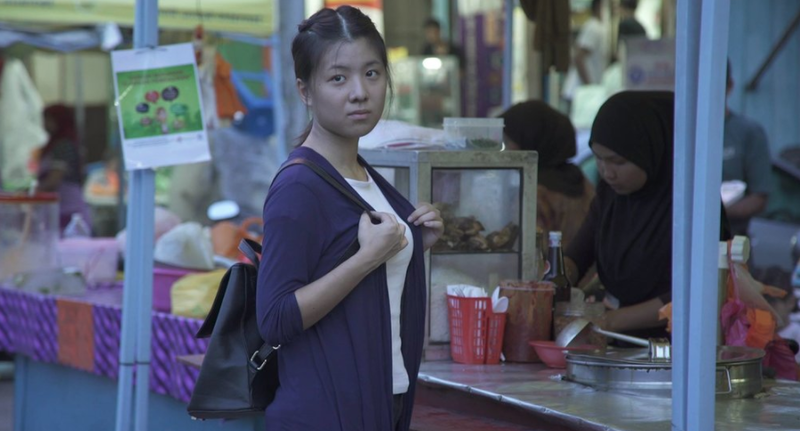 Director: Tina Yusof is an aspiring filmmaker. She had completed her degree in filmmaking at UiTM in January 2016. Since then she had worked at a production company Luey Motion Lab (LML) as a Creative Director/ Jr. Producer. During her experience at LML, she had produced 2 music videos and 1 travelogue, and directed 1 music video. She never really had a favourite director but films like Little Miss Sunshine, Me, Earl & The Dying Girl and Swiss Army Man has taught her that dark humour puts life’s troubles into perspective. A long lost journey to desire. Director: Lim Siong Wai, graduated from One World Hanxing College of Journalism & Communication on August 2016. He is continuing his further study at Chao Yang University Of Technology, Taiwan. He has been directed more than 2 short films during his diploma study and he really into it. Anak Malaysia is about a primary school kid with multiracial background, facing a cognitive dissonance about his racial identity growing up in Malaysia. Director: Khor Zhen Yee@ Justice is a Wnal year Film and Broadcasting student at the School of Communication, Universiti Sains Malaysia. He had won the First Prize in the videography category in Vision Petron National Student Art Competition 2015. He then won the Second Prize in the same category in the same competition a year later. His works had also been selected in Wlm festivals such as New York Jazz Film Festival, Chinese American Film Festival, Central Michigan Film Festival. At the cultural village, Jasmine will not only learn but also witness the beauty, traditions and immerse herself into the lifestyles of true Malays. Director: Daniel’s works often plays around with controversial issues within the topic of memory, race and cultural topics, using personal and intimate narratives. He finds interest in such topics as inspired by the much later works of Yasmin Ahmad, hoping to continue the legacy. Given the factor growing up from a mixed heritage, Daniel Cheang sees the world at a wider perspective from different cultural views and background, in hope to remind the people about the power of unity and beauty of get together. In 2016, he became the first recipient of the Best Young Filmmaker Award at an annual Golden Achievements Award night 2016 – the honour award of Golden Achievements Award of Han Chiang College. A love story between a chinese girl and malay boy and how they cope with family and social pressure. Director: Annie Ma is a graduate fromNew Era College University Drama and Visual Department. "Bunga Raya" is her final short film project and was inspired by Yasmin Ahmad.